Tofu (豆腐, Dòu Fu), often known as bean curd, is perhaps the ingredient most Westerners would associate with Chinese cuisine. But what exactly is it? Most people know that it is made from soy beans, and some might know that it the result of processing soy milk into curds. 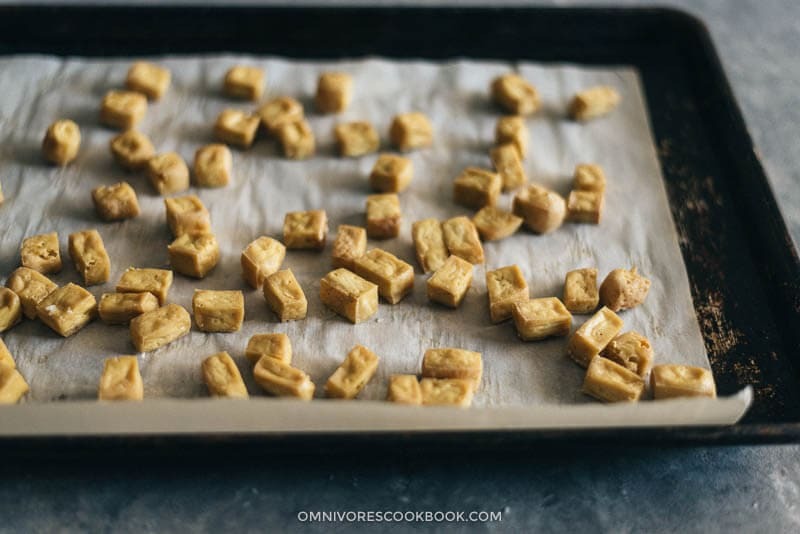 Our initial reaction to tofu is sometimes not favorable, but I’m here to prove that actually, tofu can be a super tasty plant-based source of protein when you choose the right type for your dish, and cook it to perfection. In Chinese food, soy beans are used in so many different ways – aside from tofu, check out some of the other products that can be made from this versatile pulse here. However, tofu is such an institution in its own right that it merits its own post. Tofu is made from soybeans that are ground in water, heated, and coagulated with minerals like calcium or magnesium salt. The curds are then pressed into a block or sheets, which is then sold as tofu. The process doesn’t sound very appetizing, but this centuries-old method is fool-proof and you’ll be pleased with the results! Learn how to make your own tofu from soybeans here. On its own, tofu has the reputation of being bland and having a slightly metallic or perfume-y taste. Especially if it is not handmade and comes from a packet. However, it’s supposed to be combined with seasonings, sauces and a variety of textures to really carry the flavor, much like chicken breast. Nowadays, more and more vegetarians and vegans use tofu as a meat replacement, be it for animal welfare, environmental or health reasons. Tofu has basically the equivalent amount of protein as many meat products and is higher in healthy unsaturated fat. I have often replaced the meat in my homemade dishes with a tofu substitute for my veggie friends, and guaranteed the non-veggie guests always want to try some too! It comes in two main types: silken and regular. Each of these comes in varying levels of firmness. Silken tofu has a very smooth, creamy texture. It tastes delicious raw and cooked. Many Chinese cold dishes (like this one) uses silken tofu for the texture. Sometimes I even use it in stew, such as mapo tofu and tofu seafood stew. Many people also use it in planted-based desserts, smoothie, or as a replacement for cream, yoghurt and soft cheese. Regular tofu has a slightly grainier texture and holds its shape while cooking. It is used in varies dishes such as stir-fries, stews, soup, and fried dishes. It’s a great product to use as a meat replacement due to its meaty texture and high protein content. The softer kind has higher water content will crumble more easily. The firmer kinds will is chewier and hold shapes better in cooking. Depending on whether it is soft, firm, extra firm, silken or regular, tofu can be put to a myriad of different uses. As a national food staple, it can be found in all kinds of regional cuisine from north to south. Some of the world-famous Chinese dishes you may have heard of use tofu as an essential ingredient, while others can easily incorporate it where meat would traditionally be used. Here I’ve ordered the recipes by types. But note, the regular tofu types are quite interchangeable. For example, you can definitely replace firm tofu with a softer type, especially when cooking soup and stew. The only difference is, the firmer varieties are easier to handle, while the soft ones require some care to prevent them from falling apart. The occasion I wouldn’t change tofu type is when it comes to baking and stir-frying. I always prefer using the firm type due to its lower water content. The firm type generates a better baking result and will stay in shape during stir-frying. 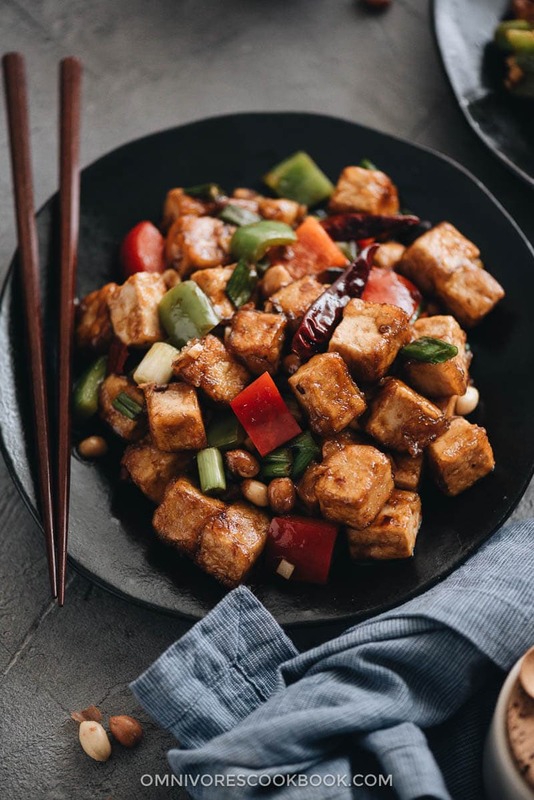 General Tso Tofu – Learn how to make extra crispy tofu with minimum oil in just 30 minutes without deep frying, plus the best General Tso sauce! Crispy Tofu with Garlic Sauce – Learn the easiest way to make crispy tofu that tastes great—no deep-frying and marinating needed! Vegan Dan Dan Noodles – Combine tofu with Sui Mi Ya Cai for a flavorful “meat” topping that tastes great and clings to the noodles. Tofu with Century Egg Salad – A childhood favorite and a popular diner food, the tofu with century egg salad requires just five ingredients and five minutes to make. Super soft, silken tofu is popular as a cream alternative. Just blend it up with spices, herbs and seasonings of your choice and you have an instant dip, yogurt, dairy-free mayo, or cheese sauce alternative that is packed full of protein. Extra silky tofu is the base of a traditional snack called dòu huā (豆花) or beancurd jelly. 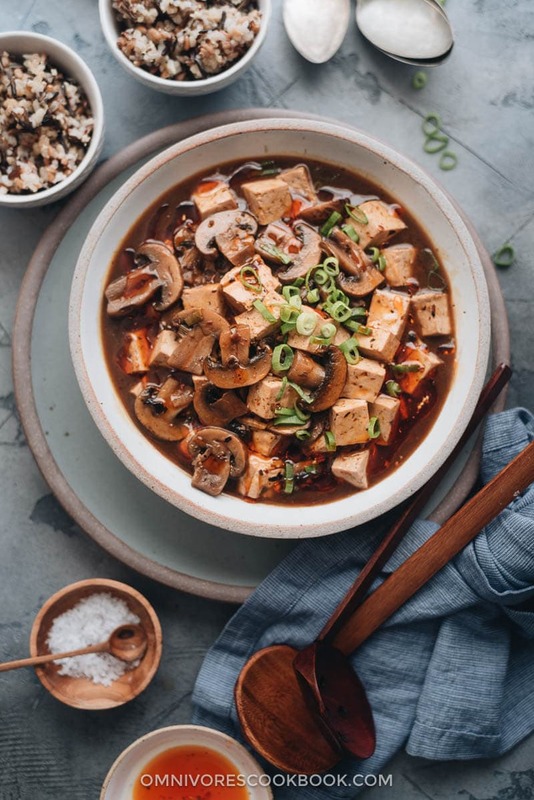 Made from coagulated soy milk, the tofu is served into bowls from a deep, steaming stock pot, with toppings added such as scallions, salt, chilis and fermented black bean sauce. Sweet versions come with red or white sugar syrup and sometimes other toppings like red beans, peanuts, sesame paste and raisins. In China, wet markets are laden with so many different tofu varieties. Some of them you might even find unrecognizable. Extra firm tofu is often formed into sheets (with the unfortunate name tofu skin) or noodles. Sometimes tofu is deep-fried for a brownish outer color. Although these are harder to find outside of China, I highly recommend to get your hands on some when they’re available. These tofu products have fun texture and taste, that is way more interesting than the regular tofu blocks. Dried tofu (豆干, dòu gān) is a type of very firm cooked tofu, either fried plain (油炸) or with seasonings. Popular flavors include Five Spice (五香wǔ xiāng), Fish (鱼香 yú xiāng), Meat umami (卤制 lǔ zhì) and Chili (麻辣má là or 香辣xiāng là). The production process is basically the same as for ordinary tofu, except the soy milk is poured thinner and the curds pressed for longer. As the name suggests, dried tofu has about 40-50% of the water content of normal block tofu. Commonly sold in vacuum-sealed packages, it is usually nutty brown on the outside and creamy white on the inside, with a chewy texture. There’s little need to marinate it or cook it with flavors like with normal block tofu as it is already pre-prepared. As such, it can be eaten raw on its own as a snack or as a sandwich filler. Additionally, you can chop it into smaller cubes or slices and chuck it into a cold salad or sizzling stir fry as a chewy tofu ‘bacon’. 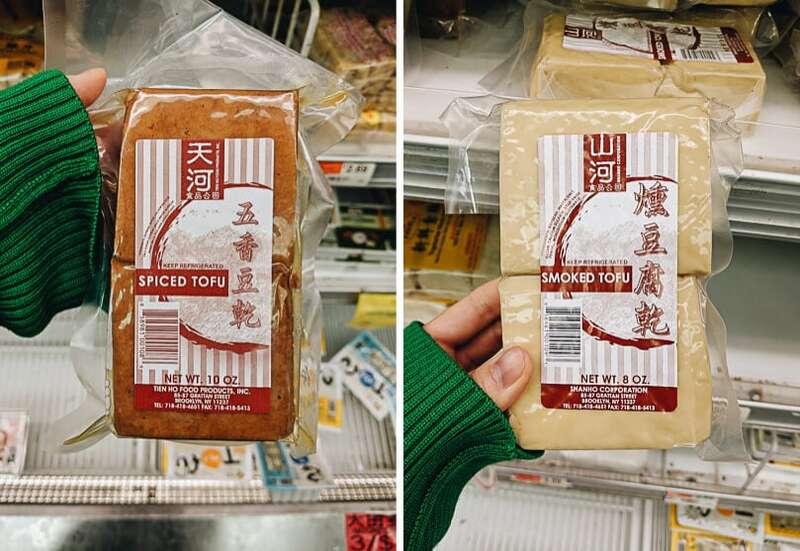 Packets of dried tofu can be bought in Chinese and Asian import shops, but there may be less choice in flavors as you’d find in China. Unopened, it has a relatively long shelf life, but should be consumed within 3 days after opening and stored in a refrigerator. I find tofu sheets (literal translation ‘bean curd skin’) a fascinating product. There are so many different varieties within this subset that suit a plethora of dishes. Basically, it refers to a very flat, thin version of dried tofu that varies in thickness, from cellophane-like membrane to chewier lasagna-like sheets. Naturally, this amount of variety means that the different names across a country as vast as China is are sometimes confused between provinces. There are two main types: the slightly thicker type (a couple of millimeters) is just a very compressed dried tofu, which is sometimes then sliced into tofu noodles. The finer, thinner version (also known as bean thread 腐竹 fǔ zhú or tofu clothes 豆腐衣 dòu fu yī) is manufactured differently from other types of tofu. It’s made from the skin that forms on top of heating thick soy milk, which is lifted off with a stick and then dried. These ‘cloths’ are sometimes shaped into noodles or pretty little knots. If you come across tofu sheets, don’t be afraid to get adventurous! I love adding them to my soup and hot pot, because they taste much more flavorful than the regular tofu. You can use thin tofu sheets to replace sushi nori, or rice paper wrappers for spring rolls. They can also make wonderfully delicate sliced flat noodles. The thicker tofu sheets can be used in place of lasagna sheets or pasta, as well as incorporated into salads and stir fries. 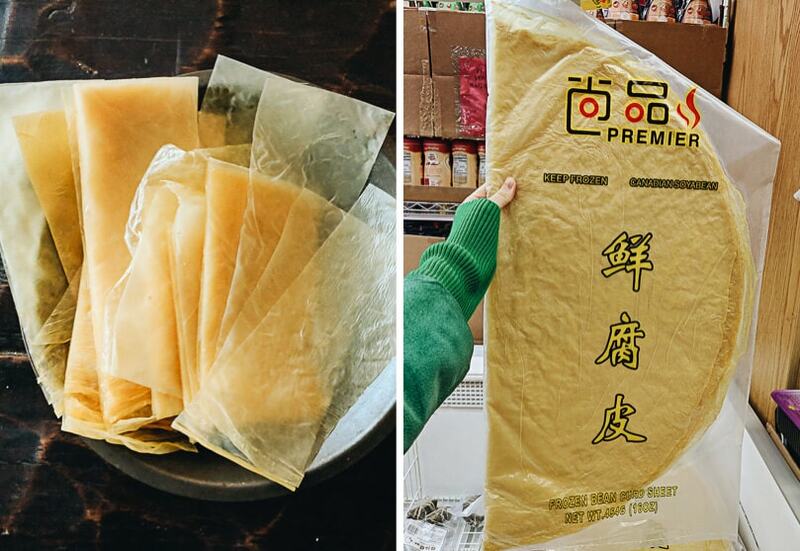 The very thin types of bean curd sheets that is semi-transparent. On the right: packaged frozen bean curd sheets. On the left: thawed and sliced bean curd sheets. They taste so good in soups and hot pot. 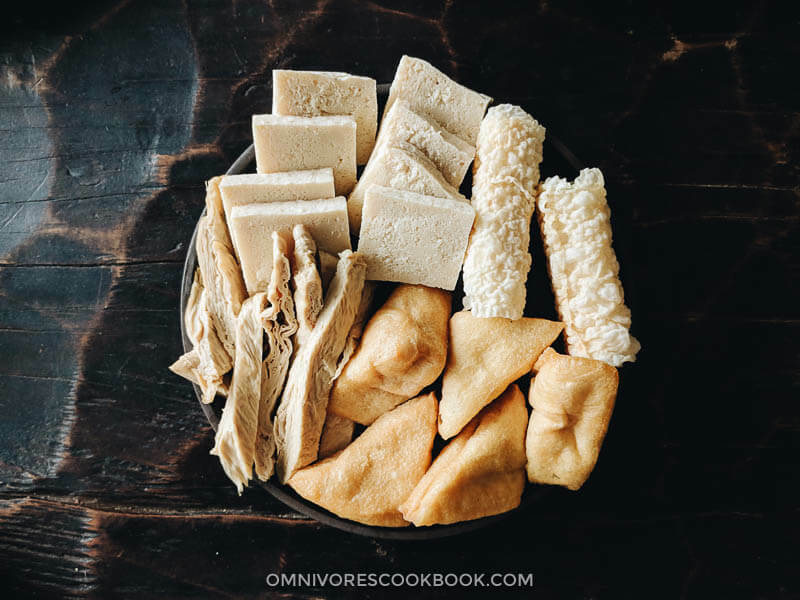 Many types of thin tofu sheets can also be found in their dehydrated form, where they will be much more solid and brittle, but easier to transport and store. That’s why it might be the only type of thin tofu sheet you can find in your local Chinese supermarket. Remember to soak dehydrated tofu overnight or for a couple of hours before using. Then you can chop or slice it as you wish and chuck the pieces into veggie stir fries for a meaty, chewy texture. 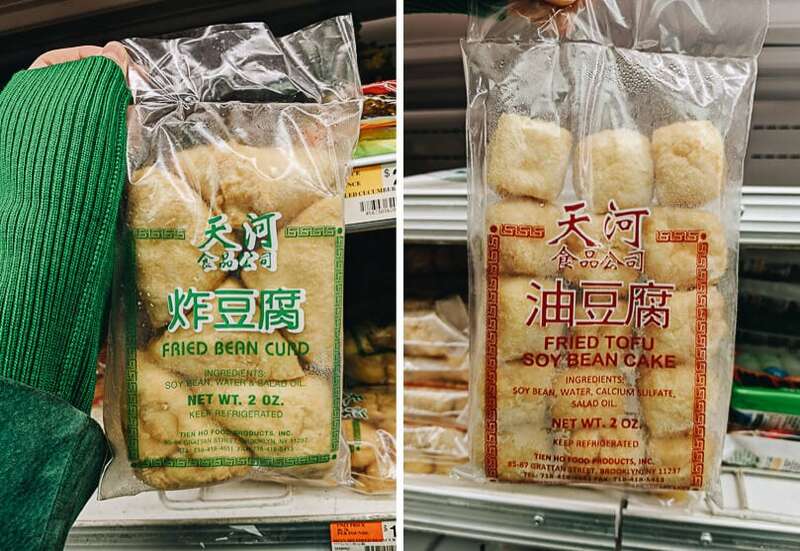 If you’re lucky, you might able to find frozen bean curd products in the freezer session in an Asian market. Simple thaw them before using. Dried beancurd (the slightly thicker type) in different shapes. All of them require rehydration before using (unless you’re directly adding them to soup or hot pot). 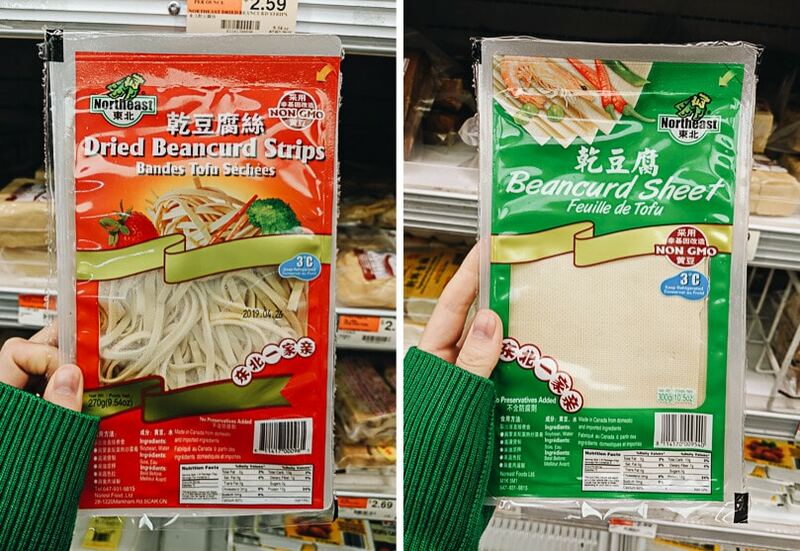 On the left: bean curd sheets that are easy to cook through. In the middle: Bean curd sticks that require slightly longer cooking time, but they absorb flavor well. On the right: knotted bean curd that looks cute. Noted, the knotted bean curd takes longer to rehydrate and cook, otherwise they will end up very chewy. I like to call these tofu ‘noodles’ because they look so similar to spaghetti! In fact, they are a sort of dried tofu product sliced into long, thin ‘silk threads’ and often come in different flavors. Much like dried tofu, sliced tofu doesn’t necessarily require any pre-cooking, but can hold its own in hot and cold dishes alike. 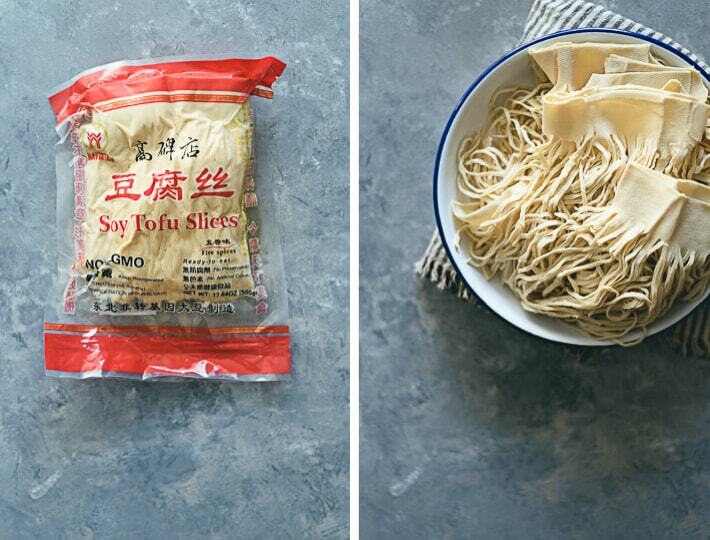 Just replace your normal noodles with sliced tofu if you want a protein boost. You can usually find sliced tofu at the refrigerated section of an Asian market. Sliced Tofu Salad – Learn how to use tofu noodles to make a 10-minute nutrition-packed vegetarian summer dish with a wonderful texture. Sometimes the name of the product can be confusing. Both of the products showed in the picture are the same type of bean curd. The right is the cut type and the right is the sheet type. Note, this type of beancurd sheet is much thicker than the one that’s mentioned above. You can usually find them in refrigerated section. The cutest type of tofu! Translated on the packet as ‘oil tofu’, they are vaguely cube- or sphere-shaped little blocks with a crispy yellow outside and a soft, spongey white inside. 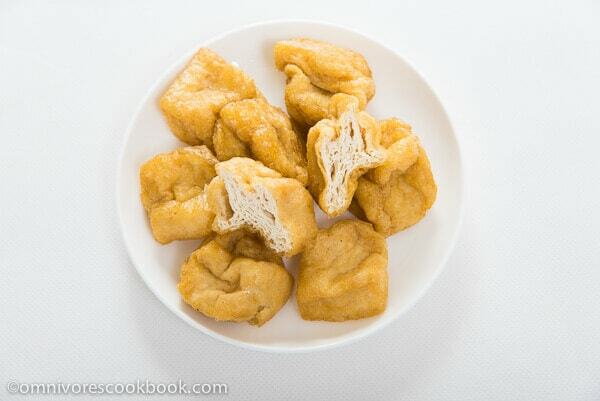 I love using fried tofu puffs in cooking, because it absorb flavors so much better than regular tofu. It also have a soft texture that makes it truly unique. You can usually find them in both refrigerated and freezer sections of an Asian market. A popular street snack all over Asia is a type of deep-fried tofu known as ‘stinky tofu’ (臭豆腐, chòu dòu fǔ), which has either a white or black crispy skin and a cheesy, umami flavor. Although the smell is off-putting, the taste is divine and you’d be missing out if you don’t try it! Stir Fried Bok Choi with Crispy Tofu – A super flavorful original vegan dish that tastes almost as good as meat… No, it tastes even better! As its name suggested, it’s regular tofu that’s been frozen and then thawed. Back in China we usually buy them at the market. But you can achieve a similar result by freezing the regular tofu. Frozen tofu has a more porous texture and it tastes chewier. In northern China, we enjoy adding them to stews and hot pot, because they absorb flavor better and hold more sauce than regular tofu. These days, tofu can be found pretty much anywhere from your local supermarket shelves to sold in big water buckets at the nearest Asian market or Chinatown. If you’re really going for authenticity, making your own is definitely the way to go. But you can find perfectly decent tofu readily available to save on time. Most Asian shops sell silken and regular tofu in plastic tubs with water, with a plastic film cover in the refrigerated section. Here you can also find ready-made deep-fried tofu, which has a light brown outer skin. 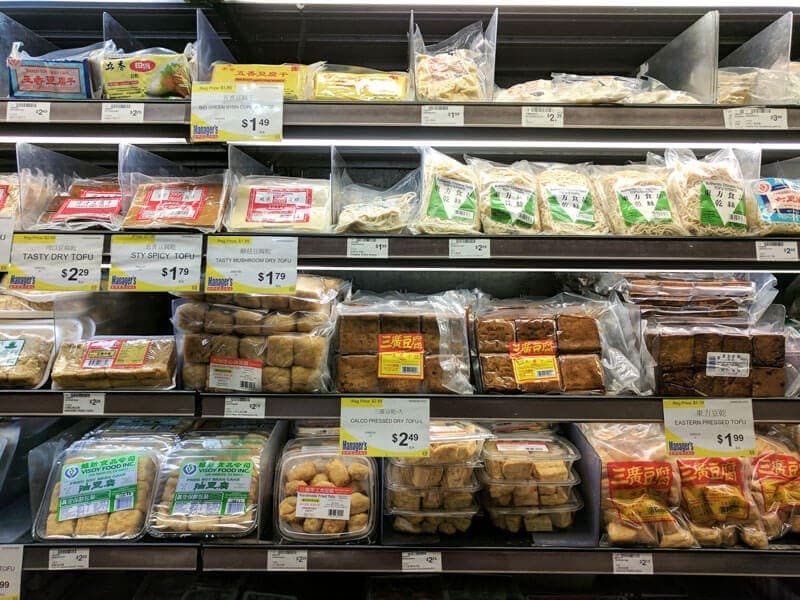 Generally speaking, you will get more tofu for your money at the Asian shops than at the normal supermarket, which usually sells far smaller packs that have been manufactured outside of China. 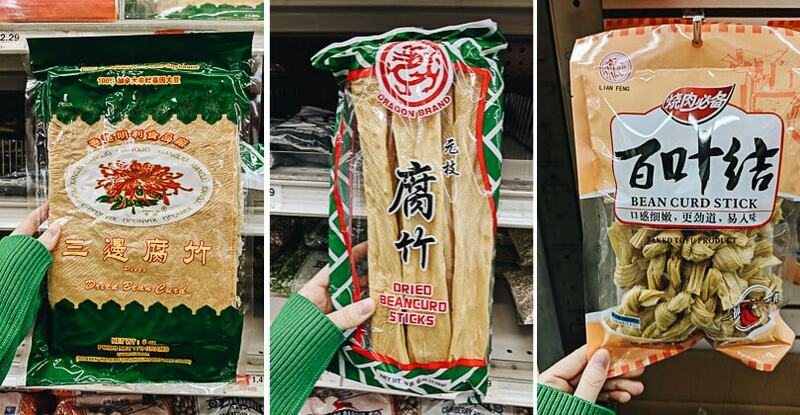 If you live some way from an Asian store or don’t have enough time to visit one, you can find a few types of tofu – Extra Firm Silken Tofu and Dried Bean Curd Skin for example – on Amazon and other online stores. Try to purchase brands based in China for authentic tofu. The shelf-life of tofu of course depends on how you bought it. 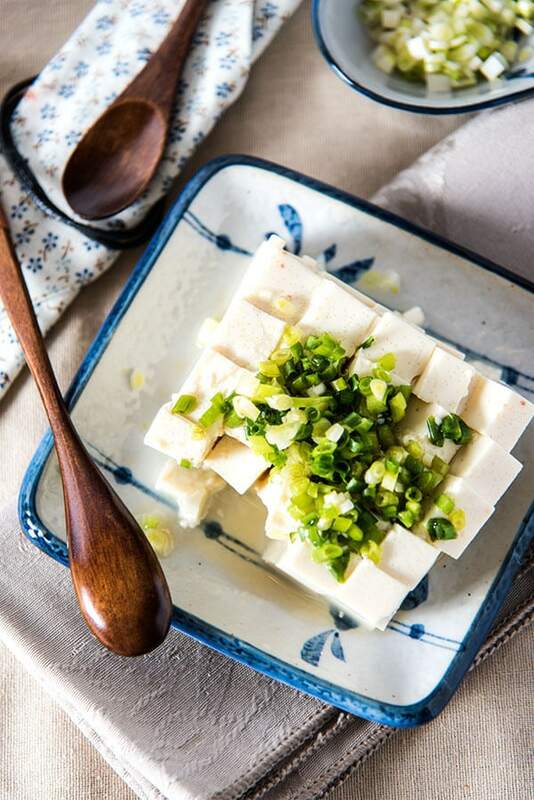 Fresh tofu needs to be eaten as soon as possible, while tofu bought in the normal plastic packs can be put in airtight containers with fresh water and stored in the fridge for a couple of days at most. If you leave it any longer than that, it will begin fermenting! 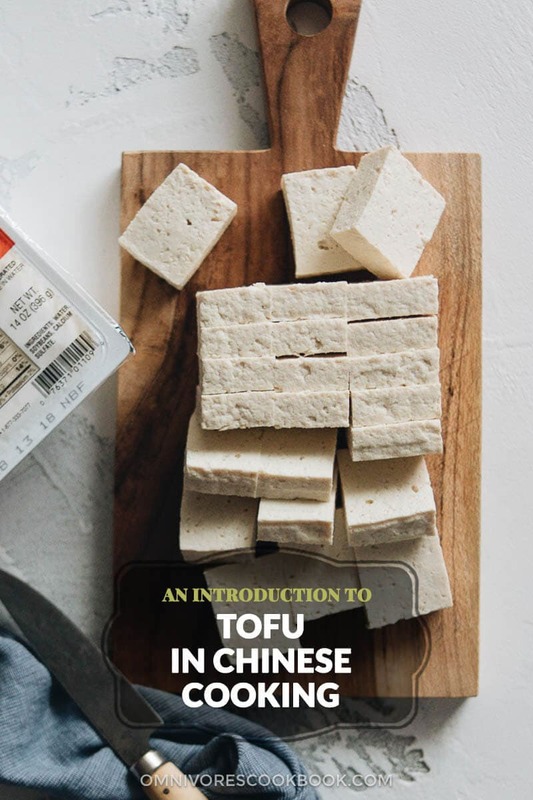 When tofu begins fermenting, it’s on its way to becoming something known as ‘Chinese cheese’ or fermented bean curd. This is often sold in jars and is incredibly salty – only to be eaten sparingly! Once cooked as part of a dish, it can be stored in an airtight container safely in the fridge for a 2-3 days or frozen for up to a month. Dried tofu skin and unopened vacuum-packed snack packs of tofu have a very long shelf life. You CAN freeze firmer varieties tofu, cooked or uncooked, for up to 3 months, which will add an even chewier, meatier texture. However, softer and dessert varieties of tofu should not be frozen due to their high water content. Leave a comment below and I’ll try my best to answer them!